john4jack (Corvallis, Oregon, United States) on 15 July 2012 in Business & Industry and Portfolio. This was taken outside of the old house. The photographer is my friend, John Morris, (I rode with him throughout the trip). Yeah, cool ! Worth photographing. J"adore voir le photographe photographié!!! très belle photo! bon le cadrage! Auch in dem Alter wo man ein Stativ braucht. Sehr schöne Aufnahme. I can see why he likes this subject... it has much photographic character! This old cutter looks so complicated. I like it with your friend in the midst of getting a good shot. A photographed photographer ;-)) Nice shot of this interesting machinery. Colors and light are wonderful !!! 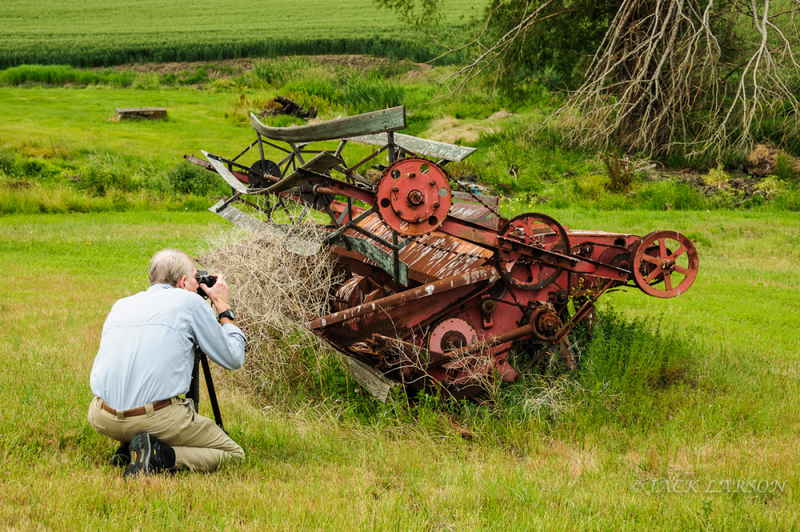 A great old machine and a photographer at work! A wonderful image! Great to have a photo pal to share such a trip with. Great shot! Superbe vielle machine avec ce photogrpahe photogrpahie elle est envahie par les herbes. Wonderful old machine! Excellent composition.